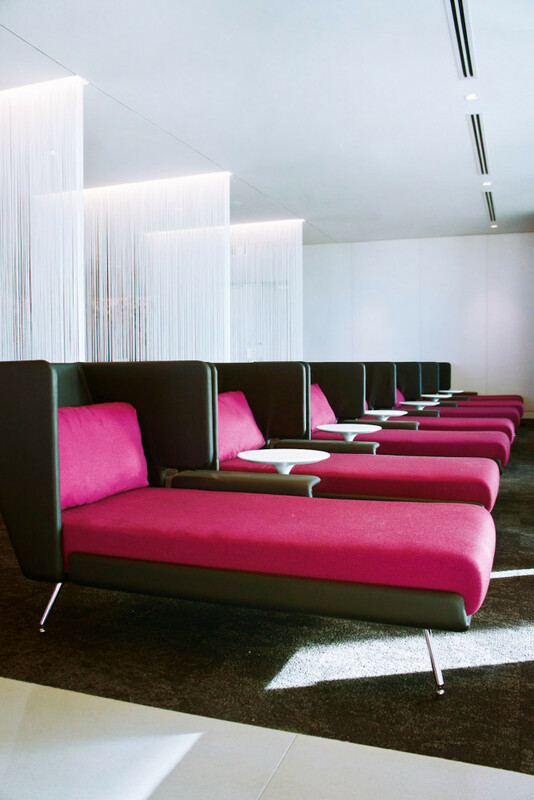 Fuchsia tones add a touch of dazzle throughout Air NZ's Auckland airport lounge. The cocktail bar with its fine New Zealand wines on display. Lie back and relax on recliners bathed in natural light. The hanging garden of the outdoor terrace. 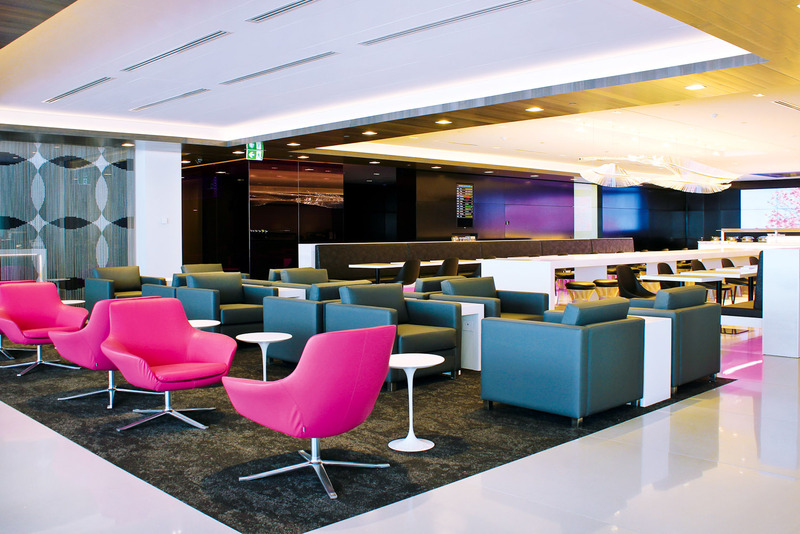 An exciting new lounge experience awaits travellers at Auckland Airport. Dan Down checks in to check it out. Normally I’d let out a groan of disappointment at the sight of an information screen displaying that my flight has been delayed by an hour. After all, how many times can you browse the same magazines at the newsagent? How many flat whites can you consume? And how many times do you ogle expensive Duty Free items that you have no real intention of buying? But this time I am positively ecstatic. 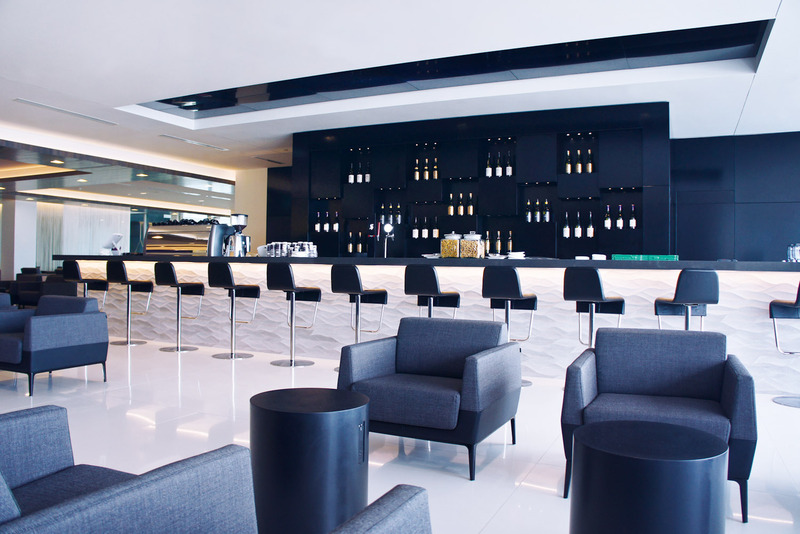 An extra hour at Auckland Airport means more time in Air New Zealand’s brand spanking new international lounge. 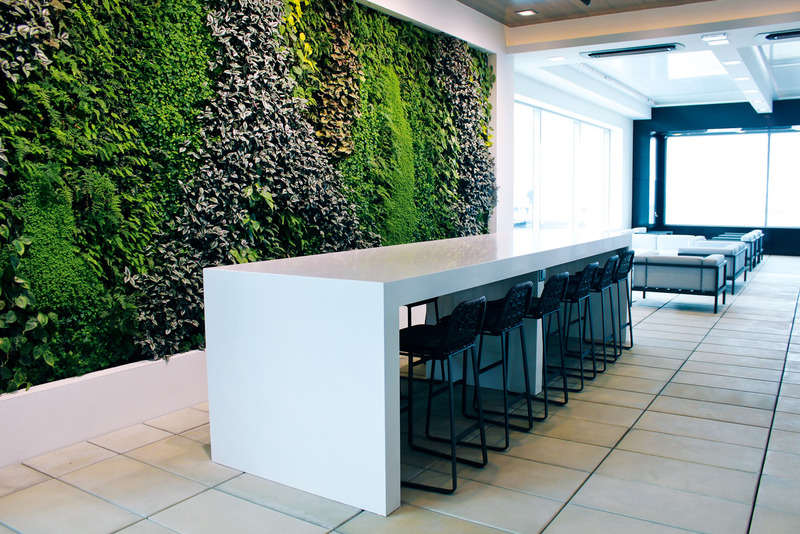 Unveiled in September, the Auckland offering complements the airline’s lounges at Sydney International and LAX, and is part of a continuing overhaul of the company’s international members’ spaces, which is costing upwards of $100 million. I couldn’t wait to see what Air New Zealand had managed to achieve in this most peculiar category of interior design: the airport lounge. Having made my way past fellow travellers who didn’t have a golden ticket, no doubt killing time on that big decision of whether to buy more boiled sweets or not, I ascend an escalator to the lounge. Being a private space, far from the madding crowd, it’s nice to have that sense of exclusivity, and I am duly ushered in without any hassle at an efficient reception. Designed by architecture firm Gensler, a calming, clean space unfolds as you round glass-walled corners, a welcome sight after the functional areas of the terminal proper. Splashes of fuchsia, and muted greys and blacks complement carefully considered pieces, such as plush swivel chairs and inviting recliners; perfect for those wanting to stretch out while in transit on a long-haul flight. All is awash with natural light making its way through vast floor-to-ceiling windows that look out onto taxying aircraft and all the busy, everyday workings of the airport. The place is vast. 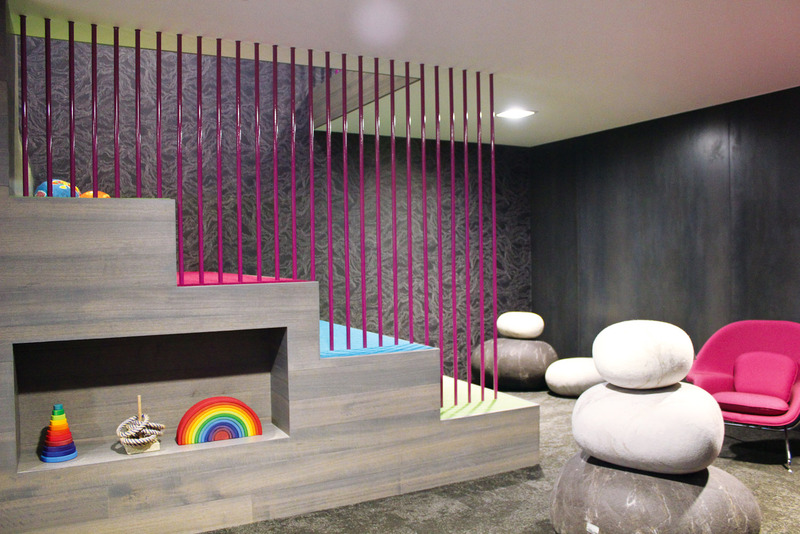 The lounge accommodates nearly 400 people, but at 2000 square metres it doesn’t appear crowded. Looking for a place to base myself for a couple of hours I hear a muffled cheer coming from a room partitioned from the rest of the lounge by blacked-out glass. Intrigued, I poke my head in to see people enjoying the Rugby World Cup on a big screen in a dimly lit, cinema-like room. It doesn’t come as much of a surprise, what with rugby being the major religion in this country. It’s tempting to join them, but I don’t want to miss the other delights on offer before I have to make a dash for the gate. First up is lunch. People are poring over a buffet of gourmet salads, cheeses, sweet meats and tea cakes, but I head straight to the chef, who’s standing behind a little kitchen, waiting for someone to try his ready to order, spicy New Zealand hoki fishcakes. He stands before a bank of large video screens, stitched together to create a vibrant wall of moving scenes of the New Zealand wilderness that many of his diners would have just passed through on their travels. I could also help myself to a cocktail or a wine or two from an elegant-looking bar, which has a digital display above it that reflects the changing New Zealand climate. However, having recently tasted my way through the Marlborough wine region I’m on something of a detox. Thankfully, there’s a brilliant barista and coffee lounge with an even more brilliant method of placing your order. An iPad let’s me easily select my perfect coffee before informing me that it will be ready in five minutes; the barista sets to work and I’m free to wander or sit and read the papers. Why isn’t this app in every take-away cafe? You can also order a coffee directly from the Air New Zealand app. Genius! Of course, what most people want to do when they sit and relax these days is surf the net, especially the international business types who frequent these kinds of places. There are USB charging points everywhere and the wi-fi is quick and easy to access, while the dedicated business zone has an array of comfortable chairs and side tables that can quickly become makeshift offices. For creative inspiration you can even get some fresh air. Entering the outdoor terrace via an airlock-type door (it can get freezing in this remote corner of the globe) I’m immediately hit by a welcome block of green in the form of a tropical hanging garden. The roof of the terrace is a clever array of louvres that can be adjusted to let the sun and air in accordingly, as well as huge glass walls looking out at the runway. However, the standout feature of this space has to be the double-sided glass fireplace for when it’s really cold. At the back of the terrace are three hanging chairs, a whimsical touch that look like they’d be more fun for children to muck about on than the colourful kids’ play area. If I was on a long-haul flight I would have made use of the spacious shower rooms, but I’m happy to lie on a recliner and read for a while. I notice there are several help-yourself bars dotted about where you can make your own cocktail, grab a cold beer or juice. Indeed, a TV hanging on a nearby wall has the rugby playing and I realise that everything I need is within easy reach. I start to fully relax, keeping one eye on the flight information screen, willing the word ‘Delayed’ to pop up and replace my imminent departure time; surely the sign of a successful airport lounge if ever there was one.